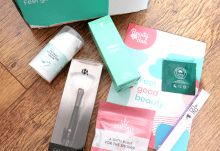 I was excited to try out this subscription because first, it is very different from anything else I’ve received, and second, their items are both beautiful and unusual. Our home is full of all manner of eclectic stuff, and both my husband Big C and I appreciate design. As I eagerly awaited the first delivery, I was slightly surprised to receive an envelope instead. 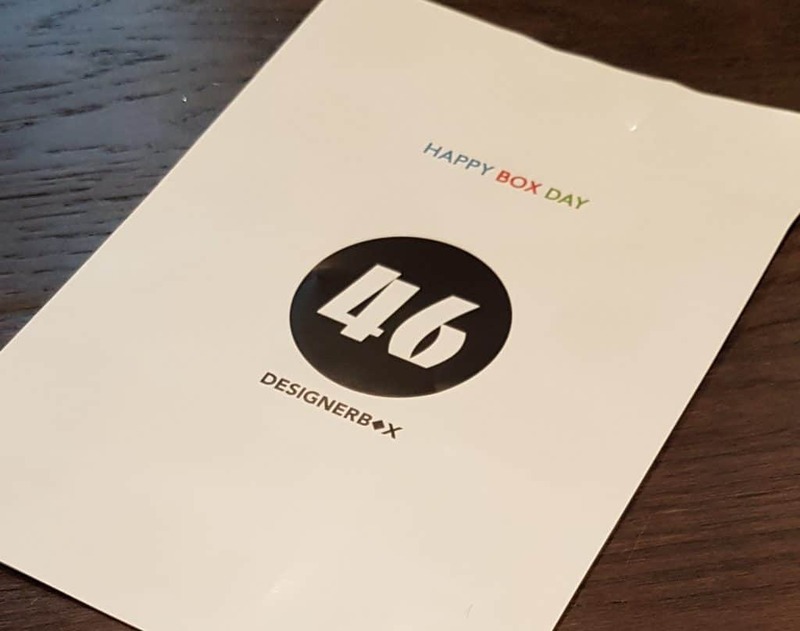 Inside was a leaflet and card informing me that this was their birthday month, ‘Happy Box Day’ and they were offering each subscriber the opportunity to choose any of the items on their website, up to the value of €50. Naturally I’d had a good look at the site, and I’d certainly liked the look of several things, but having to choose one myself? 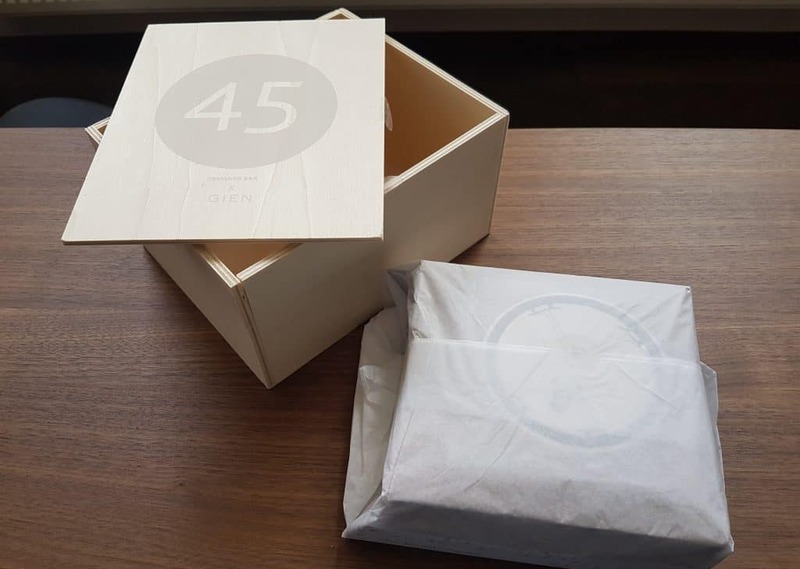 One of the things I appreciate about subscription boxes is the laziness factor; there’s a good chance I’ll get something I like, and I don’t have to make any effort. On the other hand, what a great way to start. I was guaranteed to get something I really liked, which is certainly a big win. So Big C and I sat down and went through all the items on the website one by one. Well, it was both a lot of fun and remarkably stressful. There were a few things that we nixed immediately, but we finally managed to narrow our choices down to two. And we really wanted both of them. 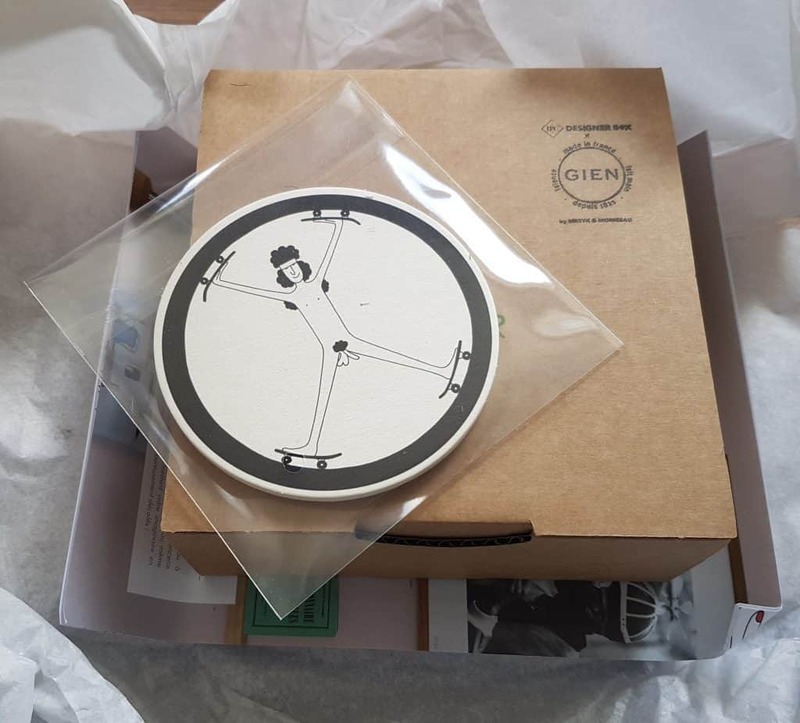 But eventually we decided to go with the thing that you’re going to see: four plates (plus four beer mats) by Mrzryk & Moriceau. This decision took us three days of back and forth, but I’m very glad we went with them. Anyway, a few days after placing the order I got shipping notification, and another week or so later a package arrived. The only clue was the French on the shipping label. 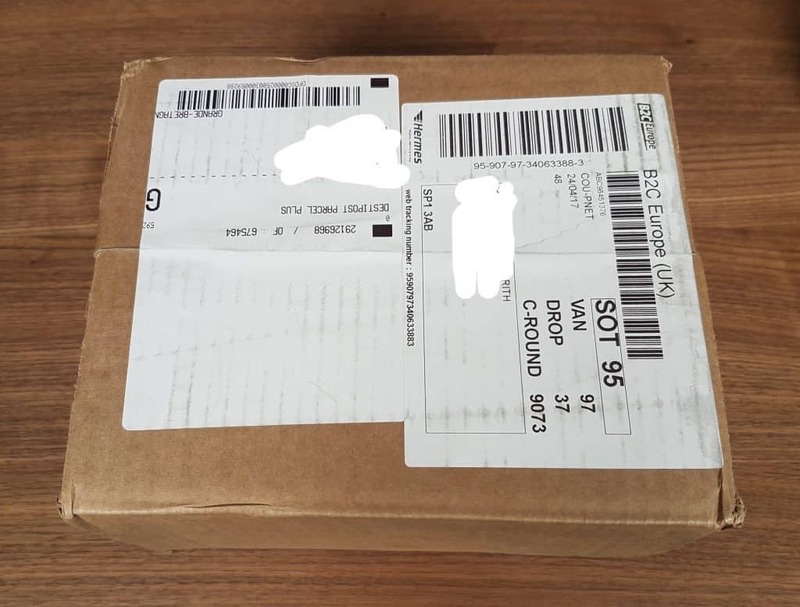 I guessed that it was the Designer Box, but I would have liked some kind of label on the packing box. But anyway, I figured it out before tearing into it with camera at the ready. The outer box was nice and sturdy and showed no signs of damage. I opened it up and was slightly confused to see what looked like the bottom of the famed wooden packing box. Lifting it up, it was clear that it was the bottom of the box, and the lid, which should have been on top, was on the bottom. Personally, I assume that the address label of a parcel is the top of the box. Either they do things differently in France or whoever packed it put the box in upside down. I could see there were little adhesive labels on the side of the box which should have held the lid on, but as I was unpacking it in reverse, as it were, they had come unstuck. I could see paper padding, which was great for protection, but not so good for the first aesthetic experience. Anyway, I got everything out and turned around, so I could see what I actually got. Yes, the numbered wooden box is very nice. 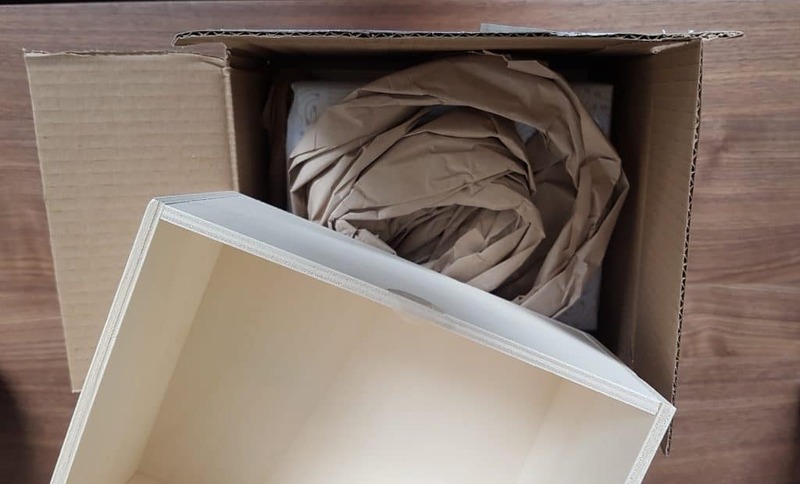 The contents were packed in tissue, and everything was well protected by the paper wadding. Opening up the tissue, on top of the inner was a little plastic envelope with the bonus beer mats in. (They’re all identical.) I love the picture, even though it makes the puerile side of me giggle. Underneath is ‘The Iconic News’, a small magazine containing information about the designer(s). Again it is in English and French. There is a nice profile of the artists, plus an interesting sidebar about the manufacture of their ceramics. Now we get to open the main event. Pahahahaha. I love it already. And I know each plate is different. Look at those. Marvellous. I’m a huge fan of line drawings and illustrations, especially in black and white, and these incredibly whimsical and surreal designs fill me with joy. 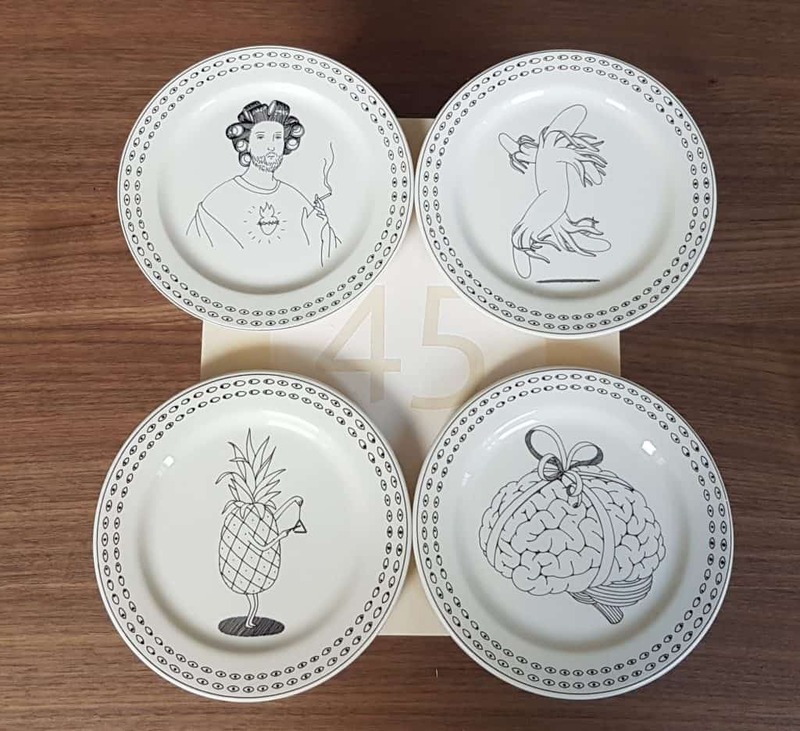 The plates are pretty small, and while they can totally be used as little side plates/presentation plates/coin tray or whatever, we love them so much we’re actually going to hang them on our wall. We’ve not done this yet, as we have to find the perfect place for them. But that’s our plan. We have lots of cool pictures, including black and while illustrations, and these will fit in perfectly. OK then. 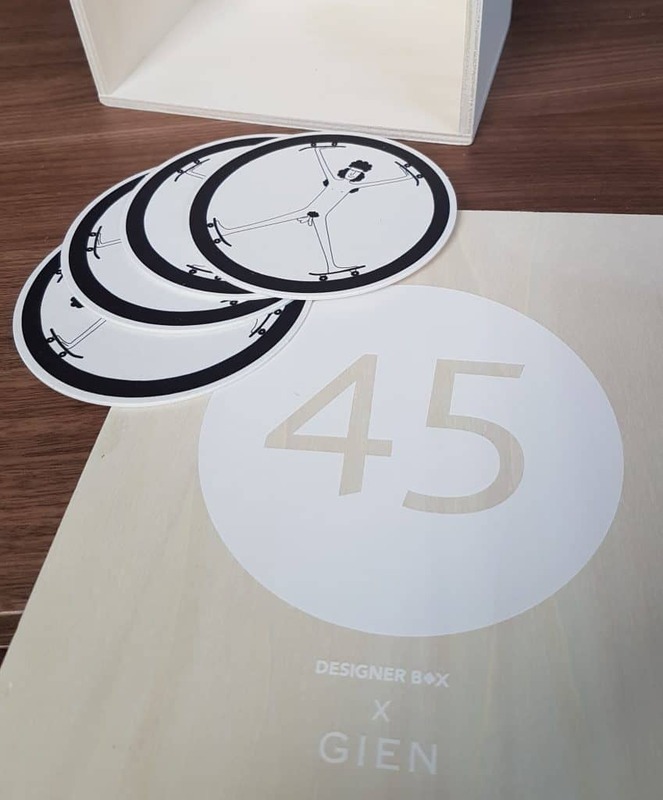 ‘Happy Box Day’ box was technically #46, though as it was buyer’s choice we chose #45, which is why the box has the 45 on top. The inner packaging is lovely. 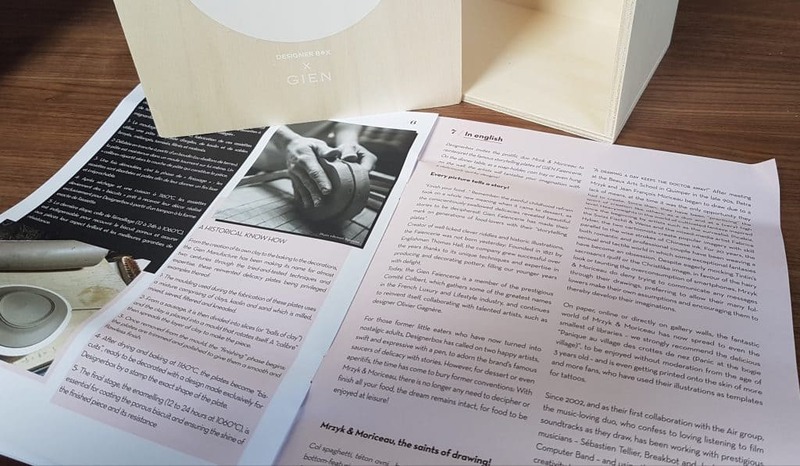 The notion of having an individual wooden box for each item gives it an extra dimension of luxury. I was slightly confused that the outer box had been packed upside down, and I would have liked to see some branding on the outer packaging. The inclusion of a little magazine is excellent. If you’re going to have something ‘designer-y’ it makes sense to find out something about the people who designed it. It’s a tiny shame that it was wrapped up around the box and so was kind of bent and creased, but it’s not a big deal. It’s also a relief that it’s dual-language. Having the beer mats as a little extra is a nice bonus. I wouldn’t miss them if they weren’t there; they’re cardboard so semi-disposable, but it’s a thoughtful addition. The subscription price point is pretty good. It’s difficult to work out real values for exclusive items such as these, but looking back on past boxes I think it’s unlikely you would feel you’re not getting value for money. 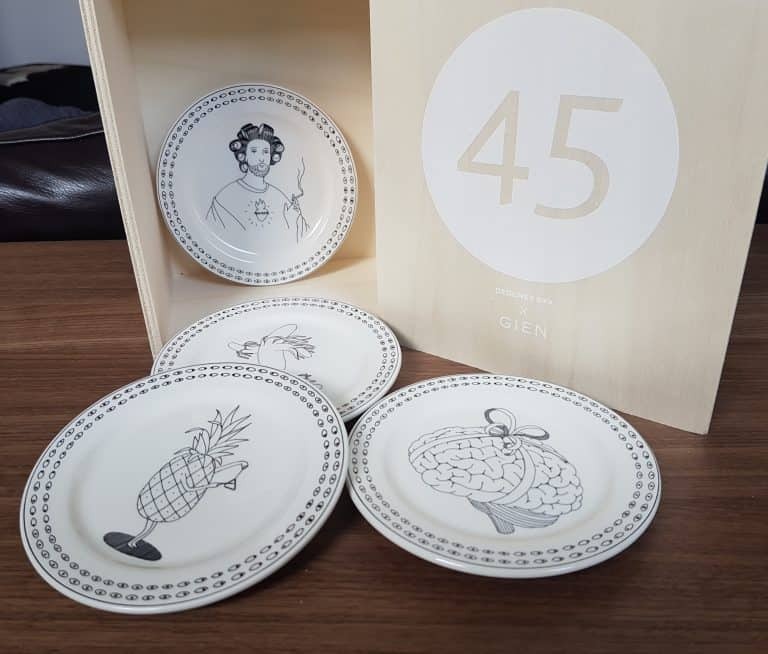 These gorgeous plates remind me of things you can find in Liberty (the amazing store in London) and they would cost a damn sight more than €39 for the set. Aside from adding to your own home decor, this would also make a superb gift, either as a one-off or an ongoing subscription. Who wouldn’t love to receive something like this in the mail every month? 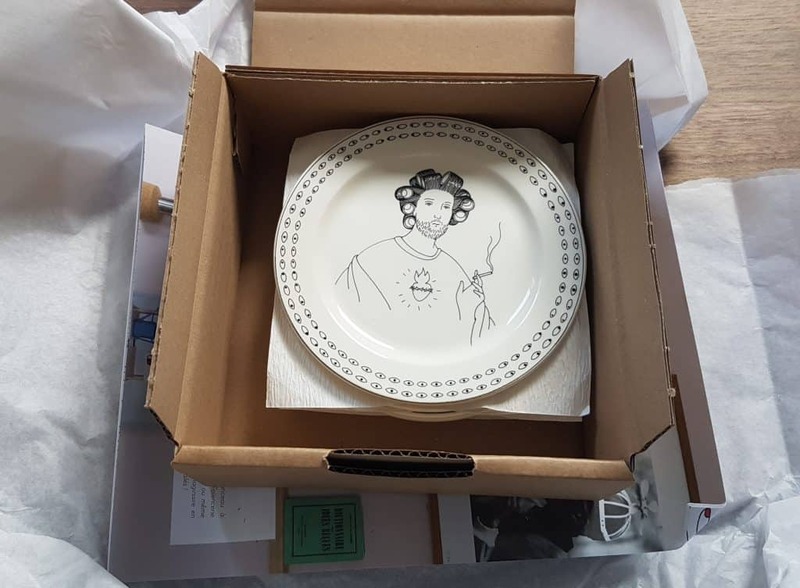 Also, do check out the artists Mrzryk & Moriceau who designed these plates. Their illustrations/pictures are marvellous. I would totally have one (or more) of their prints on my walls. I love this. I utterly love this. Despite the (relative) stress of having to choose from so many lovely things, I’m so incredibly happy we got these. Having an occasional subscribers’ choice is a pretty good idea, as many people might like to have something to complete their collection, or have another of something they love, or even something lovely to give as a gift. 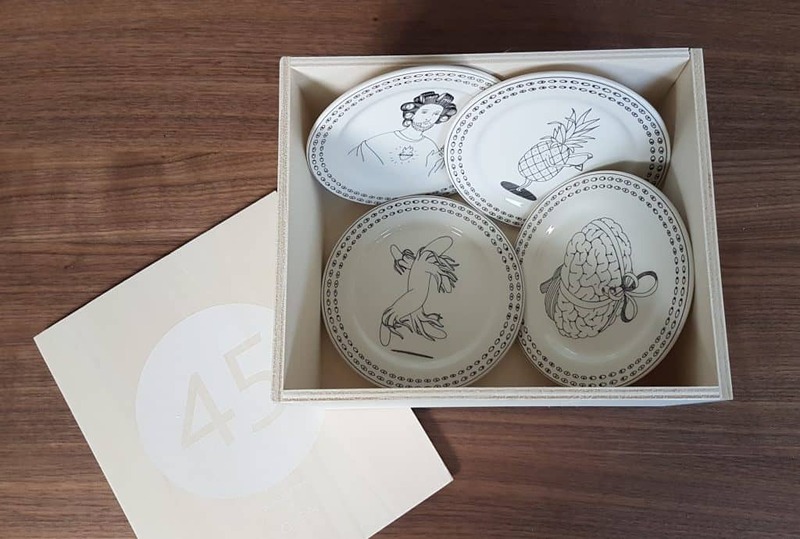 There’s no guarantee you’ll love everything they send, but the exclusive nature of their collection certainly means you won’t see your thing in every other home! Looking at previous Designer Boxes I like some things more than others. I’ll be intrigued to see what they come up with next. But this is off to a flying start.